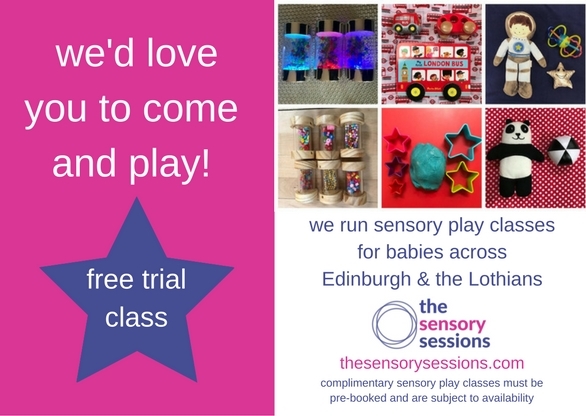 The Sensory Sessions run our popular sensory development class across venues in Edinburgh and Midlothian and we’d love to welcome you along to our sessions. In this post today, we thought we’d tell you a little more about what happens in our sessions. Our classes are 50 minutes long, the perfect amount of time for a baby, and are split into two sections, a led play session and an exploratory session. When you arrive at our classes you and your little one will be welcomed by our class leader who will help you settle in and find yourself a place on a mat. We’ll explain to you our format, the theme for our class and timings. Our classes are all themed so you can discover classes such as under the sea, cowboy week, pet week and visual development week at our sessions and each session uses some familiar toys, to build up memory and practice skills, and some new ones too. Our sessions have been developed by an occupational therapist trained in sensory development with babies and she trains our class leaders and is on hand to answer any questions that come up in our classes or in the community group so we are able to tailor our activities to any needs that your little one has. The first half of our class is led play, we start by doing several activities together as a group. The activities are planned at a pace suitable for little ones and we do activities that work on our little one’s body scheme, visual development, introduce lots of textures and noises. We also look at their fine and gross motor skills. We then give our little ones that all important rest, it is a great opportunity for you to meet your little one’s needs by feeding or changing as well as having a chat with your next door neighbour. The second half of our class is exploratory play, we set up several different areas all based around our theme and talk you through activities to do in these areas. This helps with our sensory integration as we do activities that involve using lots of our senses together. We end our classes doing calming activities together, to calm our sensory systems down at the end of our fun learning session together. Our classes are all baby led, never worry about needing to feed or change, if your little one is tired or needs cuddles or you need to move around, we are completely used to it and it is not a problem for us to talk you through the activities at any point in a class. All of our equipment is cleaned between classes to ensure that it is sparkling clean for you to enjoy. Do get in touch if you’d like any further information or if we can answer any of your questions. You are very welcome to join us for a free trial of a sensory development class in any of our locations, we’d love to welcome you along to play!